Oyster harvesting is a full-time occupation for women along the estuaries of Ghana’s coastal zone. Particularly, what are termed mangrove oysters provide an important source of income and nutrition. However, oyster pickers have recently confronted a dangerous new challenge—oyster stocks are falling drastically. As population in coastal villages increases, a growing number of women take up year-round harvesting, resulting in serious depletion of oyster stocks. In the communities of Tsokomey, Tetegu and Bortianor, where USAID’s Sustainable Fisheries Management Project (SFMP) works with fishers, and fish processors and traders, oysters stocks were drastically dropping. Oysters become harder to find and women were seeing the mollusks getting smaller and smaller. Supported and trained by USAID’s SFMP, the Development Action Association, a local NGO, worked with the Ghana Fisheries Commission to help oyster pickers organize themselves into the Densu Estuary Women’s Oyster Pickers Association (DOPA). They developed an organizational charter, standard operating procedures, formed a steering committee and received training in the basic science of oyster habitats and reproduction. Thirty core members of DOPA were trained on how to collect and understand measurements of water quality, water salinity, turbidity (how much dirt and sand is suspended in the water) and pH, a measure of water acidity. “We learned about oyster habitat, growth and spawning cycles,” says Bernice Agorogo from Tsokomey. Bernice Agorogo (right) at work in the Densu Estuary at Tsokomey, Greater Accra. 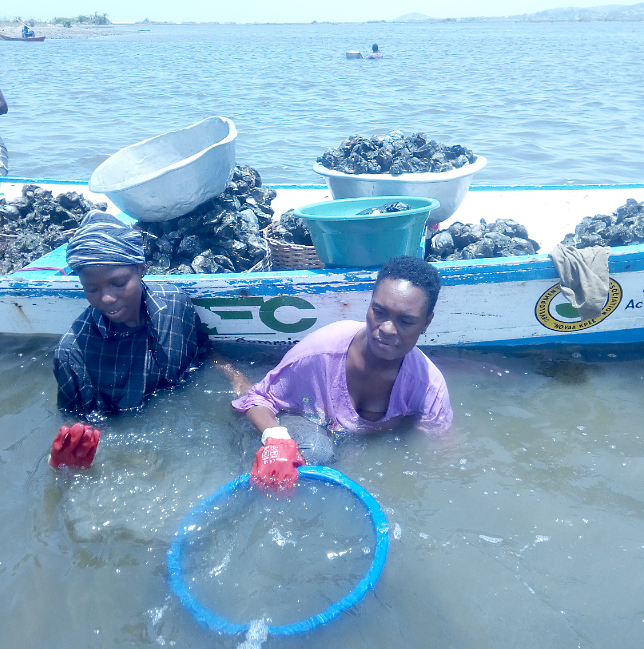 Bernice and others in DOPA are optimistic about the prospects of oyster harvesting in their communities as they work to formalize an annual closed season that can increase their harvest, meet their families’ nutritional needs, and improve livelihoods. Mirroring the success in the Densu Estuary, SFMP and its partners are now taking community-based management to the Ankobra and Pra estuaries. Dr. Margaret Atikpo, one of the SFMP leaders on community engagement, sums it up. Editor’s note: SFMP is part of USAID’s Global Feed the Future Initiative.